Dave’s Auto Care is Lake County, Ohio’s Premier Auto Service and Maintenance Facility for a reason – we strive to make the car repair experience as simple as possible for our customers. Our 24 Hour Drop Off Service is for people who need to drop off or pickup their vehicles outside of our regular business hours. 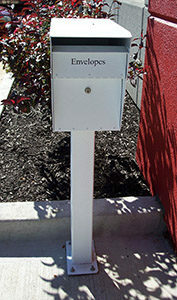 The mailbox next to our front door has envelopes for you to put your car keys in and a place to write your instructions. 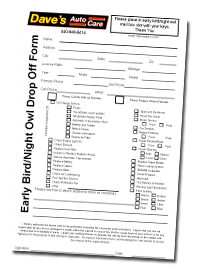 Save time by clicking here to print a form now to leave with your car later. Please don’t forget to leave a contact phone number and any special instructions.